A new generation of mobile apps is enhancing public safety at colleges and universities across the country. With smartphones now ubiquitous on college campuses, more universities are finding ways to take advantage of their combination of communication and geo-location features to enhance campus safety instead of relying on "blue light" phones in fixed locations. And many campuses are building their own mobile apps, often partnering with entrepreneurial students to create cutting-edge, user-friendly tools. At the Rochester Institute of Technology (NY), a survey of students led to a change in the school's approach to campus safety. "Several years ago we did a perception-of-safety survey and one theme in student responses was that we weren't using technology to its fullest potential," said Chris Denninger, director of public safety. So in 2011, Tony Yazback, an RIT public safety investigator, began brainstorming with students and met Eric Irish, who was a resident adviser at the time. 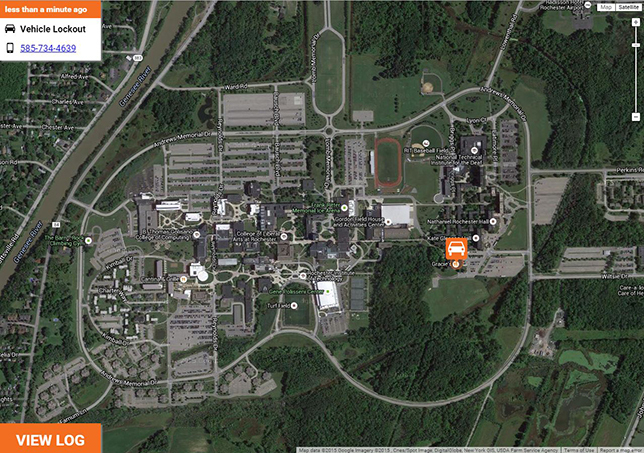 Irish had an idea for a mobile app that would eventually become TigerSafe, a campus safety app named for RIT's mascot. "We wanted to make it user-friendly for our customers and for our dispatchers," Yazback said. "I met with those officers and got input from them. Based on that information, Eric built a dashboard for the dispatch officers and then he built the app for students and staff." The TigerSafe app integrates with Google Maps to show dispatchers the exact location of an incident or request for help. Assist provides the blue light button, which communicates the user's location, contact details and related information. After pressing the button, the user is dialed into public safety personnel to continue the conversation via phone or text message. The app is integrated with Google Maps, so when an alert comes in, it pings the user's exact location and shows the dispatcher an icon — for instance, for a jump-start request the icon is a car battery. "Looking at the data so far, the single biggest use is for noise complaints and room or vehicle lockouts," Yazback said. "People just want to input the information and get the noise shut down, and it really is quick and efficient." One student who had a seizure remembered he had the app on his phone and called for help. A blind student who usually traverses the campus with a cane got turned around and ended up behind the Gordon Field House. "He was able to push the blue light and ring into our dispatcher, who was able to see exactly where he was, due to the coordinates," Yazback recounted, "and we sent an officer who was there in three or four minutes." Getting students to download the app requires persistence and good marketing, Yazback noted. "We put posters all over campus in the dorms and put door hangers out. We engage the residential life and RAs for the buildings. They are marketing it also. A lot of the newer students have it," he said. "We are in the neighborhood of 6,000 downloads. I expect it to grow each year, so that everybody will have it at some point in time." For the past three years, the University of Florida also has been using a campus safety app developed by a former student. TapShield, which was developed by Jordan Johnson, a former student body president, was downloaded by 10,000 of the 50,000 students on campus, said Officer Wayne Clark, a public information officer with the UF Police Department. "Our goal would be for every student and staff member to use it, since it was geo-fenced around the UF campus for their safety, but we can't make everybody follow all our safety tips." Clark said that although TapShield has not yet been used in a real emergency situation, it worked well in tests and has some nice features. "If you went running at nighttime, you could send your route to a friend so they know where you are," he said. "You could set a timer for 30 minutes, and if you don't turn off the app in 30 minutes it goes into a countdown mode, and at the end of the countdown, it informs us and as long as you are on campus, we would know where you are." A feature called "Yank" automatically sends an alert when headphones are pulled from the device by force. But the UF Police Department recently experienced one of the challenges of working with startups: Clark said the campus was just informed that TapShield had failed to win enough contracts with other campuses to keep the business going beyond the seed funding it received. He said the Police Department would work with students, emergency managers and the administrative staff to look at other options. While the student government funded the app originally, Clark said, "I don't know if the second time around the Police Department is going to pitch in or if student government is going to look for a replacement." 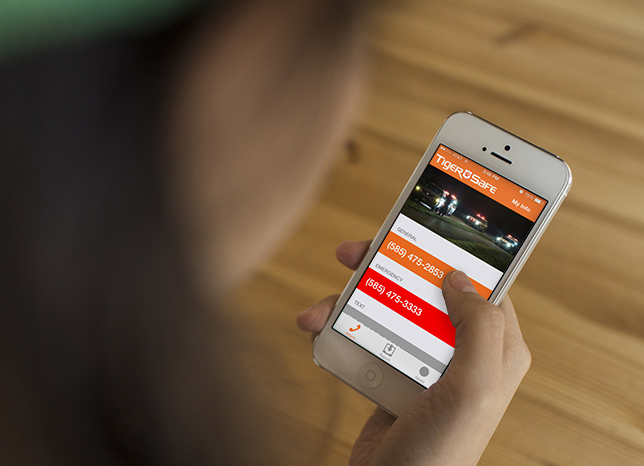 UF also uses a TapRide app from a company called DoubleMap for its Student Nighttime Auxiliary Patrol. "We have seven 15-passenger vans that run from 6 p.m. to 3 a.m.," Clark said. Once students and staff have downloaded the app, they can enter where they are, where they are going and how many people are with them. "We dispatch our drivers and we can give them an estimated time of arrival, and then when we are on scene we can give them a "honk" push notification to their phone, letting them know we are outside. Last year we gave 130,000 escorts and most used the app," he said. Both UF and RIT officials said that student app developers have great insights into features and user interface design principles. But RIT's Denninger said his team took into consideration the uncertainty of working with a startup. "We entered into a three-year contract with him," he said. "After year three, there is an opportunity for us to talk about the future." RIT could extend the relationship, look at what is commercially available, "or we might hire another student and see what he or she could do." Beyond taking advantage of the immediate notification capabilities of smartphones for communication during an event, institutions also are customizing apps that disseminate emergency preparedness information. Since 2013, Northwest Missouri State University has been using a tool called CrisisManager from SchoolDude to disseminate emergency procedures and policies. Previously, the campus just directed people to information on its Web site, said Lt. Mike Ceperley, emergency management coordinator. "I was looking for a platform to put that information in the hands of students. I came across an app at the University of Louisville. I thought it was a great idea, so I did some research, found CrisisManager and they helped us set it up. Now that information can be updated automatically and not just in a binder sitting on somebody's shelf somewhere." The app features information categorized by scenarios and offers actions to take in cases of fire, severe weather, evacuation and workplace violence. The plans are customized for emergency events at Northwest Missouri State. Each plan includes phone contacts and online resources. The app also features an audible siren and a flashlight. In addition to the basic plan for students, faculty and staff, Ceperley plans to create an emergency plan specifically for senior leaders during crisis events and another for residential life staff. He stressed that users should familiarize themselves with the information in the app before an emergency occurs. His department does not use the tool for push notifications during an event — the university has an emergency text alert system for that. "This could be great information during an emergency, but at that point often it is too late," he said. For example, after a storm rolled through campus recently, "A few guys told me they were in the middle of a tornado warning and they were trying to figure out what they are supposed to do. They said, 'So this is what he meant by it being too late to use the app.' So we try to get people to use it in a pre-emptive way, but some use it as a reference during an event."